i’ve made some pretty amazing things last month, from everything pretzels, to apricot jam hand pies, to cinnamon rolls! i have unedited photos for each of these things up my sleeves, and given the rate of things these days, you’ll see them here in about a year. 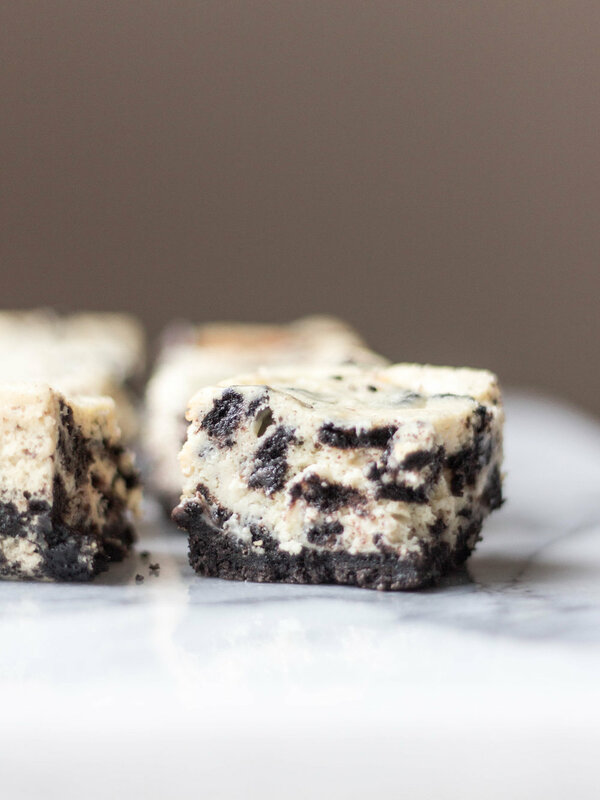 in the meantime, i’m offering you guys oreo cheesecake squares as a peace treaty. i made these first back in college, and i’ve made these probably at least fifteen times, even counting the time i made these for a friend’s wedding in 2013.
for these cheesecake squares, you have a crust is made up of Oreo cookie crumbs and a cheesecake filling with chopped up oreos folded right into the batter. 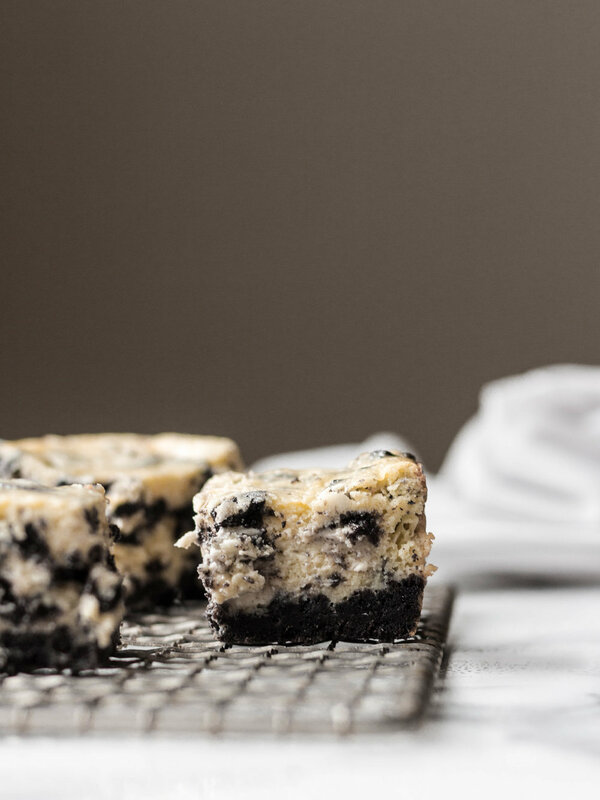 the result is a delightfully creamy cheesecake with the Oreo flavor that we all love, cut into squares for easy access. they have just the right amount of sweetness and highlight both the cream cheese and Oreo cookie flavors quite fairly. i made these 300 of these squares for a wedding as an amateur college kid- if that tells you anything about the recipe you’re about to view below. Preheat the oven to 325 F. Line an 8×8 square baking pan with foil or parchment paper, allowing it to hang over two of the sides. make the crust: place the oreo cookies in a gallon-sized ziploc bag and use a rolling pin to crush them into crumbs. Pour the Oreo crumbs into a medium bowl, and pour the melted butter over the crumbs and mix until the crumbs are moist. pour the crumbs into the lined pan, and press evenly into an even layer. bake for 10 minutes; leave the oven on when done. make the cheesecake: while the crust is baking, Beat the cream cheese until smooth, about 2 minutes. Gradually add the sugar and beat until incorporated. Slowly add the eggs, beating well after each addition. Scrape down the sides of the bowl; add the sour cream and vanilla. Beat until incorporated. fold in the chopped oreos (i just break them up with my hands). pour the cheesecake batter over the baked crust. bake until the cheesecake edges are set, but the middle still jiggles slightly, about 40-50 minutes. let the cheesecake cool to room temperature. cover the pan with plastic wrap and place in the refrigerator for at least three hours, or overnight, before serving. slice the cheesecakes into squares, and serve! Store in an airtight container in the refrigerator for up to a week.